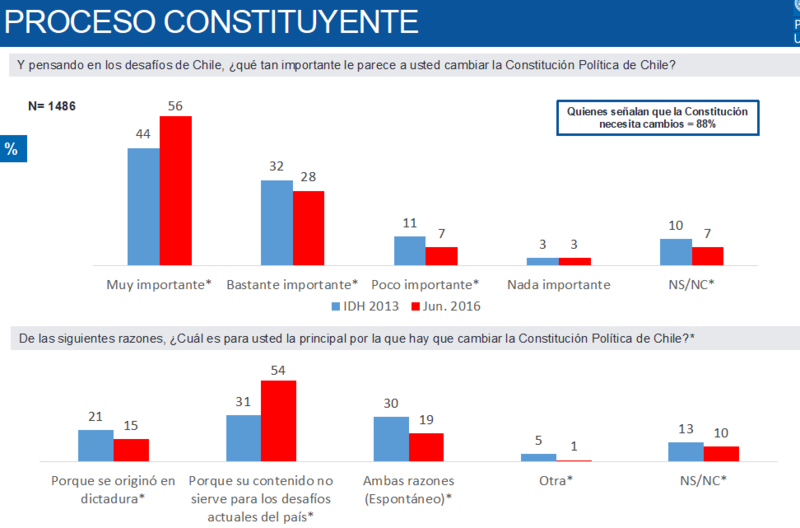 In the case of Chile, opinion polls reveal a complex relationship between public opinion and constitutional issues. By listing separately, as possible answers, ‘constitutional reforms’, ‘education’, ‘health’ and ‘criminality’, the question posed by the poll implies that the existing constitution plays no role in explaining why the latter concerns figure among the top priorities of the population. The relationship between constitutional issues and opinion polls should be carefully examined, critically assessing how the questions are framed, how constitutional preferences and attitudes may result in concrete political behaviour, and considering how important it is to (re-)connect constitutional issues, constitutional problems and solutions, with the lives and everyday concerns of the people. This column appeared on The Constitution Unit blog. In general, opinion polls ask about our political preferences within established political systems. They ask us to express our political preferences or attitudes regarding the range of political options that the current constitutional system allows, either in the form of political candidates, ideas or reforms. In the US, opinion polls on constitutional matters have been fundamental for the analysis of the jurisprudence of the Supreme Court, either for predicting judgments or for explaining its reasons. Moreover, opinion polls are an important instrument for ascertaining the degree of support, political approval, or legitimacy that a certain political system garners among the population. However, opinion polls are also an important tool for asking people hypothetical questions, such as the ones that emerge from the exercise of constitutional powers. Indeed, opinion polls can be an interesting device for investigating the possibilities that may derive from exercises in constitutional imagination. In this scenario, the relationship between opinion polls and constitutional issues is multifarious: on the one hand, they can be an interesting measure of the degree of legitimacy of an extant constitutional arrangement; on the other, they can inquire into the possible outcomes or possibilities that may be open under alternative constitutional frameworks. In the middle, we can find those techniques of social research that attempt to capture the degree to which issues of legitimacy may result in positive dispositions towards creating new political institutions, or crafting a new institutional arrangement for addressing political issues. In countries not at risk of experiencing violent political conflict, or that are not close to institutional collapse, the different relations between opinion polls and constitutional matters constitute an important source for broader political analysis. In the case of Chile, opinion polls reveal a complex relationship between public opinion and constitutional issues. In the face of a presidential election that will take place on November 19, the relevance of constitutional issues for the political agenda is a matter of debate. Although the country is undergoing a ‘constituent process’ pushed by the government of Michelle Bachelet, which during 2016 implemented a consultation process (which included self-convened meetings and open citizens’ assemblies organized by the government) for the people to discuss what constitutional issues should be included in a new constitution, there has been scant ‘popular’ mobilisation around the issue after the end of that consultation process in August of 2016. We are not witnessing the degree of popular mobilisation and exchange of opinion that would be required for a ‘constitutional moment’, according to Bruce Ackerman. Chile has one of the lowest rates of political participation around the world, and it is part of a select list of countries where the fall of political turnout has been the sharpest since 1990 (a list which includes Congo, Libya, and Madagascar, countries which, unlike Chile, have experienced recent and serious political conflicts). According to a recent report by the United Nations Development Programme (UNDP), political disaffection and the loss of popular trust in political institutions should be a warning sign for Chilean democracy. However, in the view of an important part of the political establishment, the lack of political interest by the citizenry is not a matter of concern. Indeed, they interpret the scenario just described as an expression of the maturity and consolidation of Chilean democracy. According to Carlos Peña and Harald Beyer – two of the most influential public intellectuals – Chileans, in particular the middle class created by the economic growth and political stability of the decades since the end of the Pinochet dictatorship, are satisfied with their lives and with their prospects for the near and mid-term future. Based on the analysis of different opinion polls and reports, they claim that political abstention should be understood as a sign of the consolidation of a society with advanced patterns of consumption, in which spaces of autonomy have decoupled individuals’ life-projects from the burdens of collective horizons of meaning embedded either in communities, societies, or the state. For these intellectuals, constitutional matters are not appealing for the Chilean society of 2017, composed of subjects that seem more interested in their individual well-being rather than questions of collective concern such as the discussion of a new constitution. 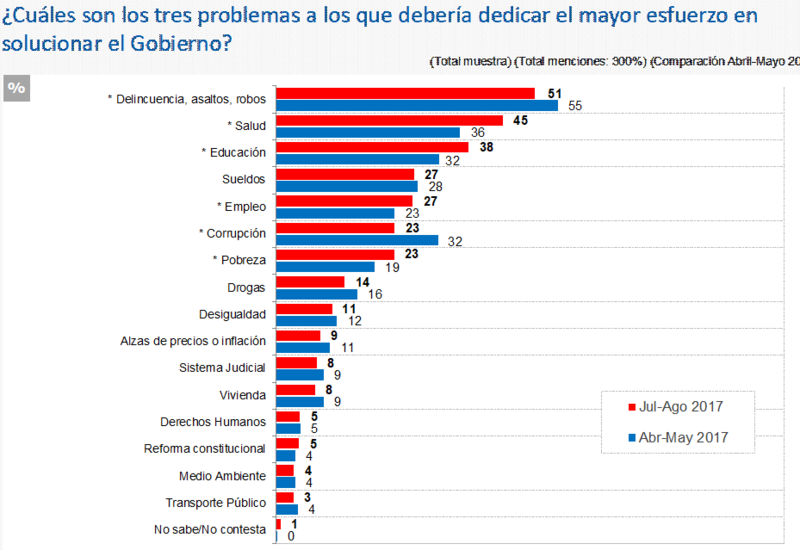 According to the right-wing liberal think-thank Centro de Estudios Públicos [Centre for Public Studies], which runs the most methodologically well-regarded opinion poll, the concern for ‘constitutional reforms’ ranks very low among the priorities the population, much lower than the top three: crime, health, and education. Source: Centro de Estudios Públicos, Estudio Nacional de Opinión Pública September -October 2017. Based on these studies, the ‘liberal establishment’ supports the idea that political representatives should dismiss the constitutional agenda promoted by different social movements and then pushed forward by the current government. Furthermore, it constitutes now the basis of right-wing campaigning for this month’s election, and it is also attractive for several factions within the centre-left coalition that oppose the constitutional agenda of the President. In other words, they emphasise that politicians should focus more on what are often referred to as the ‘real issues of the people’: employment, security, and other basic services. By listing separately, as possible answers, ‘constitutional reforms’, ‘education’, ‘health’ and ‘criminality’, the question posed by the poll implies that the existing constitution plays no role in explaining why the latter concerns figure among the top priorities of the population. On the contrary, it can be argued – as many have – that the problem of poor and unequal access to quality healthcare (which explains why ‘health’ is the second highest concern of the population) is related to the subsidiary role that the Pinochet Constitution assigns to government in the economy in general, including the provision of services such as healthcare and education. Shouldn’t we explore the possibility that the general concern over the issue of health entails the need to address issues related to the ‘new constitution’ or ‘constitutional reforms’ that could end with the subsidiary role of the Chilean state in the economy? Or, alternatively, what if we say that one of the problems that make health a top priority relates to the constitutionally protected freedom to choose a private health system, which contributes to the fact that the public health system remains of a poor quality. What these mainstream opinion polls do when asking citizens for the urgency of the new constitution is to frame the issue as a zero-sum game against other concerns, thus obscuring the connections between what directly concerns the citizen and the constitution. According to several other opinion polls, such as those by the UNDP, an overwhelming majority of Chileans consider that the current constitution requires important or major reform, or that the country simply needs a new constitutional arrangement. When asked for the reasons for it, citizens claim that the fact of having been enacted under a dictatorship does not constitute a major flaw of the existing constitution; rather, a majority of the population thinks that the Pinochet Constitution is not appropriate for the challenges the country is currently facing, such as the urgent need to address the claims and interests of the indigenous population, or the widespread support for more egalitarian access to basic public services. 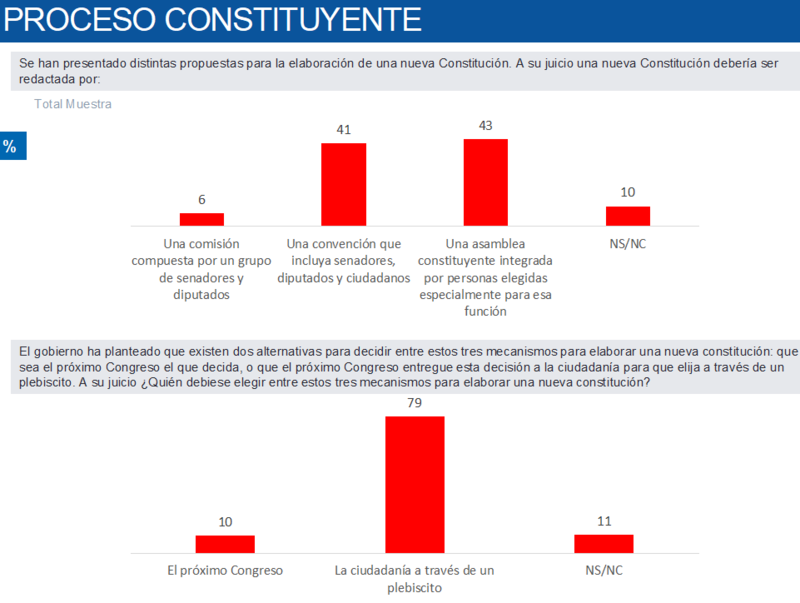 Furthermore, a majority of Chileans think that Congress is not the body that should decide on a new constitutional arrangement (6%) but, rather, are in favour either of a ‘constitutional convention’ (composed of citizens and congresspeople) (41%) or a constituent assembly of representatives specifically elected for that purpose (43%). Opinion polls are an important source of information for constitutional debates, especially in countries where the emergence of the constituent power as a disruptive force, either in the form of violent conflicts or institutional collapse, is still at a distance. However, the relationship between constitutional issues and opinion polls should be carefully examined, critically assessing how the questions are framed, how constitutional preferences and attitudes may result in concrete political behaviour, and considering how important it is to (re-)connect constitutional issues, constitutional problems and solutions, with the lives and everyday concerns of the people.